Situated off the north coast of County Antrim in Northern Ireland (NI), Rathlin Island hosts a community of just over 150 residents and remains a popular draw for tourists, attracted by its natural beauty, walking and cycling options and abundance of seabirds. Up until this year, the island has maintained links with Ballycastle, County Antrim via two passenger ferries: the 22.5m x 6.4m, 1975-built Canna and the 18m high-speed aluminium passenger cat Rathlin Express, which was built by Arklow Marine Services of County Wicklow, in the Republic of Ireland, in 2009. Given her age, NI’s Department for Infrastructure (DFI) decided last year to retire Canna and to commission a new companion for Rathlin Express. Fending off international competition, Arklow Marine won the tender for this replacement vessel, which has now entered service as Spirit of Rathlin. Other than their variances in size, the main difference between Rathlin Express and Spirit of Rathlin is that the former is a passenger-only ferry, capable of carrying up to 96 passengers between Ballycastle and Rathlin Island within a timeframe of approximately 20 minutes, whereas Spirit of Rathlin can carry 140 passengers in addition to six cars or an articulated truck, and typically within 30 minutes at a service speed of 9.5knots. The new ferry was designed by Argyll Maritime Services of Duror, Scotland, in cooperation with the UK Maritime & Coastguard Agency (MCA), Lloyd’s Register and naval architecture firm Burness Corlett Three Quays. Billy Tyrrell, director, Arklow Marine, explains: “Spirit of Rathlin makes four return trips daily, 365 days of the year. As the ferry is island-based, and stays there overnight, it has also created eight full-time and two part-time jobs.” Fashioned in steel throughout, Spirit of Rathlin was designed as a bow-loading ferry, with a 120m² vehicle deck (strengthened to 1.1tonnes per m²) situated forward. The enclosed passenger lounge, which accommodates 42 persons, is located aft, while a further 100 seats are fitted into the open-air spaces for passengers on Deck 2 (80 passengers) and Deck 3 (18 passengers). Spirit of Rathlin features a double-chine hull and a flat bottom, and has been fitted with heavy grounding bars forward, “to facilitate grounding on the slip when loading and discharging”, Tyrrell says. Interestingly, the vessel was designed and constructed to meet the regulations for both an EU Class C passenger/vehicle ferry engaged on domestic voyages and a UK workboat under 24m (MGN 280). Alisdair Salmon, director at Argyll Maritime Design, explains: “While certification under the workboat code was not absolutely necessary, the dual passenger/workboat code certification involved very little additional work or cost, and a few potential advantages. For instance, when operating with 12 or less passengers, she can operate as a workboat code vessel. Prior to construction, model testing was conducted at Southampton University’s Wolfson Unit,“to determine the correct powering required to achieve a trial speed of 9.5knots with a design deadweight of 54tonnes,” Tyrrell says. 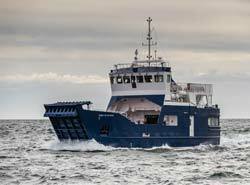 Subsequently, Spirit of Rathlin is powered by two Scania DI13 071M units, each rated 331kW at 1,800rpm. These drive a pair of fixed-pitch, five-bladed, Ni-Al Bronze (AB2) propellers, featuring diameters of 940mm, through a Twin Disc MGX 5114SC-HD gearbox with a 2:54:1 reduction ratio. One key consideration was to ensure that Spirit of Rathlin's engine room was made relatively spacious, for the crew’s convenience and safety. Special attention has also been paid to onboard wastewater treatment: the ferry deploys an Ecomax 8AC sewage treatment vacuum system, while a monitoring system watches over the contents of four tanks, the bilges in nine areas and the draughts at four locations.